We are not all morning people, although by some stroke of fortune I, personally, have been both a “night person” and a “morning person” in my life. (But I'm bipolar, so I guess it stands to reason.) Anyway, if you are one of the people who say, “I love you all the time, I just love you better after a cup of coffee,” my sympathies. I've been on both sides of the fence, and when I get into my morning phase, I really enjoy whistling and singing something like the old Judy Garland song, “Good morning, good mo-o-orning, Sunbeams will soon smile through . . .” while my wife considers the penalty for first-degree murder in the State of Georgia. Here, though, is a great trick no matter how groggy you feel when you wake up. Lie in bed for 30 seconds and refuse to let the world rush you. Say a prayer. I find that I have a sense of peace that can set my mood for the whole day, just by thanking God that I am alive and going to Him the very first thing at the start of the day. I bet you never realized that “In the beginning was the Word” was not just an historical statement, but a suggestion on how to live. We organize our lives into days, and the beginning is when we first wake up (or second or third wake up, if we roll over and go back to sleep). At any rate, when you wake up to get out of bed, give yourself 30 seconds. Take a deep breath, thank God you're alive, and get right with Him first, before anything else. If your day, like the universe, has Christ at the beginning, it is really going to make a difference. Once you say any sort of prayer, you can find a way to make a plan that will without doubt improve your day. 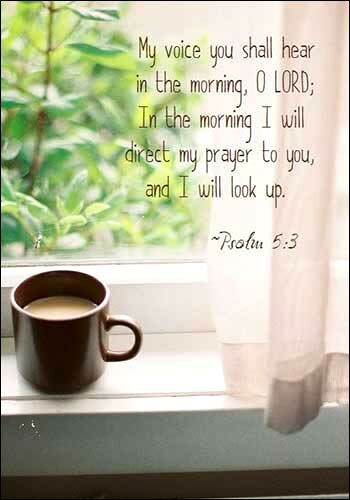 Lord, let me remember you from the time I wake up every day. Amen.